The cats at my house are all out of sorts. Instead of their usual complaints of empty bowls resonating through the house at 4 am, the cats are now howling at 2 am. Not sure how a one hour time change equates to a two-hour shift in my cats’ inner clocks, but there it is. Standard Time is returned, the last yellows of the poplars and the final reds of the maples are hanging on, but will soon be gone. Can it really be November already? It has been quite a busy month (which you may have inferred from our lack of blogging). The Foxfire Mountaineer Festival has come and gone – just about a month ago, actually. In spite of a misty, foggy day, we saw nearly 2000 folks come out to Clayton for a day of folk crafts, games, music, and some really good food. Up on The Land, we have entertained around 1000 visitors over the past month, including first graders from Demorest Elementary and a group of girls ranging from 6 to 14 from the American Heritage Girls organization. 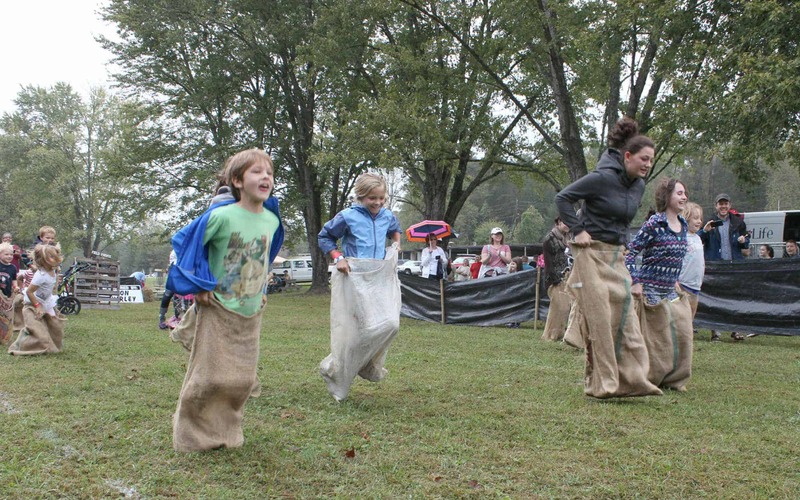 The sack races were a popular attraction for the kids at this year’s Foxfire Mountaineer Festival. Though, our most anticipated guest has been autumn’s own splendor. Nothing makes those of us up here who rely on tourism dollars more nervous than a slow-to-start leaf season. We had strange weather associated with some named storms, the most impactful being Irma, which caused so much destruction for millions, stretching from Miami to us, up here in Northeast Georgia. So many folks lost things in the way of homes and cars. Up here, damage was minimal, but many of us were without power for a full week. But, the autumn has come and it is always spectacular here. We’ve been invigorated by the cooler temperatures and the crispness in the air. We have restarted our efforts to clean out some of the cabins that have gone largely unused for the past 20 years or so – trying to make the most of that valuable resource. We are in the early stages of creating an artist village, taking four cabins that are clustered on the western side of the property and transforming them into something useful. 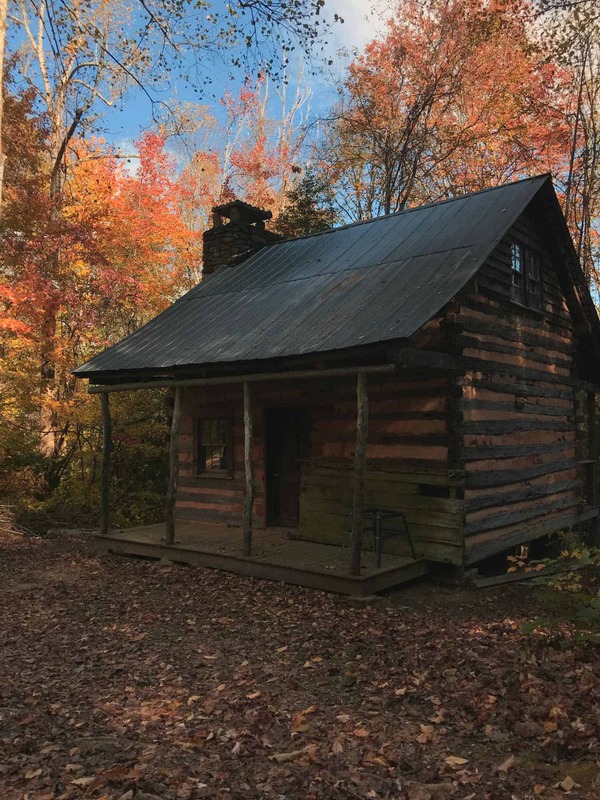 Specifically, our aim is to transform the “Woodworking Cabin” into a weaving studio, the “Camping Cabin” into something of a writer’s retreat, the “Warwoman Cabin” will become a homesteading demonstration space, and, finally, the “Phillips Cabin” is being made into an herbalist demonstration space. In all, these cabins will enjoy new life and activity – something they deserve. The Phillips Cabin is the future home of the Foxfire Herbalist program. We have also begun work on reviving an old trail that once existed between Foxfire and Black Rock Mountain State Park. This project will further tie us to our neighbors up the mountain. This past summer, we created some programmatic partnerships with Black Rock – partnerships that have enhanced things for our visitors. With this trail, we will be able to do even more to deepen the experiences for the tens of thousands who come each year. 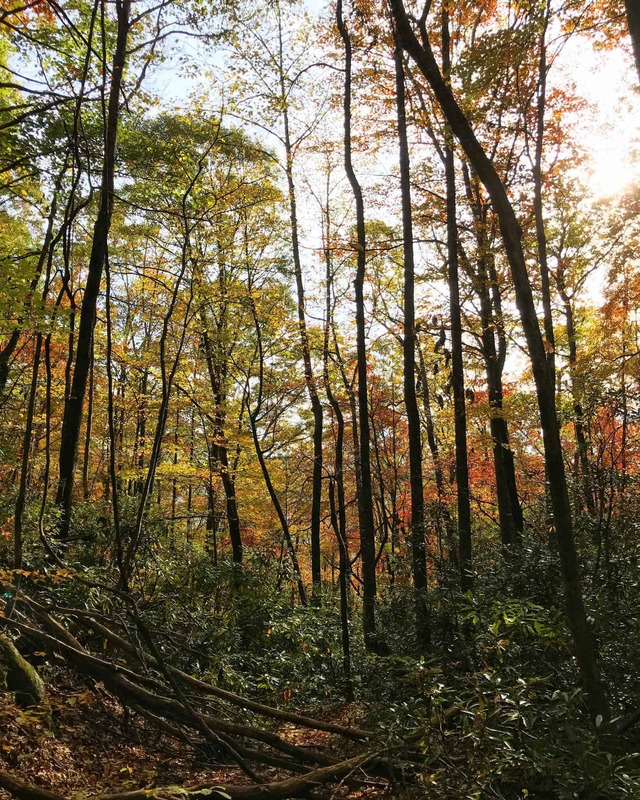 A portion of the old trail between Foxfire and Black Rock Mountain State Park to be repaired this winter. So, it seems we will have a number of projects to keep us busy as we enter into the colder darker days of late autumn and then winter – activities to warm the soul of this place and bring renewed life in the spring. There is something therapeutic about healing these spaces. The process is always full of hope and promise. T.J.–How exciting to read of ALL you have planned to expand and improve Foxfire!!! It is such a valuable setting for so many who have experienced the books and now can look forward to having even more fun seeing how these experiences have been preserved for all to enjoy. Thanks for all you do to keep Foxfire moving forward!! !